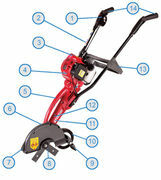 The Atom Deluxe Lawn edger is light weight and extremely easy to start boasting a Honda GX25 engine. 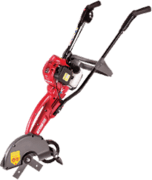 The four blade system is powerful and efficient cutting your edger's more aggressively ensuring a sharp finish to your lawns edge. 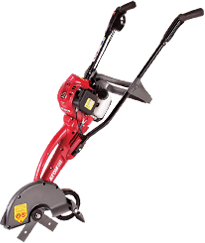 The Atom edger can cut round corners, curbs and gutters meaning the Atom edger can get anywhere in your backyard. So to ensure you can keep your edges sharp all night long drop in to Henderson Mowers & Chainsaws Ballarat to purchase your Atom edger today. 1. Trigger switch control with safety interlock. 3. Honda GX 25cc four stroke engine. 5. Handle, to enable easy lifting and transportation. 7. Edge guide, to ensure your edges are straight as they can be. 8. Four blade cutting system, made from hardened steel blades for smoother operation and a longer life span. 9. Debris deflector, on a spring return system. 10. A durable and manoeuvrable 6" wheel. 11. Fully enclosed blades guard. 12. Cutaway showing section of precision ground solid steel drive shaft with hardened precision spiral bevel, reduction gears for high torque to drive long blades. 13. A cross frame to ensure added stability to your Atom machine. 14. For operator comfort the Honda deluxe has air cushioned bio-rubber handle grips.